A repeatable example of tower, specially designed for bats, with the aim of understanding, appreciating and envisioning a more productive relationship between architectural and biological systems. Bats are mysterious animals, commonly seen as evil creatures and associated to the night and blindness. Actually they are animals at risk of extinction and that could mean a significant problem for the planet Earth. As other species, as bees, they provide to maintain ecological balance. They eat a lot of insects, especially mosquitoes, contribute to pollute a lot of plant species and their droppigs are really fertile. 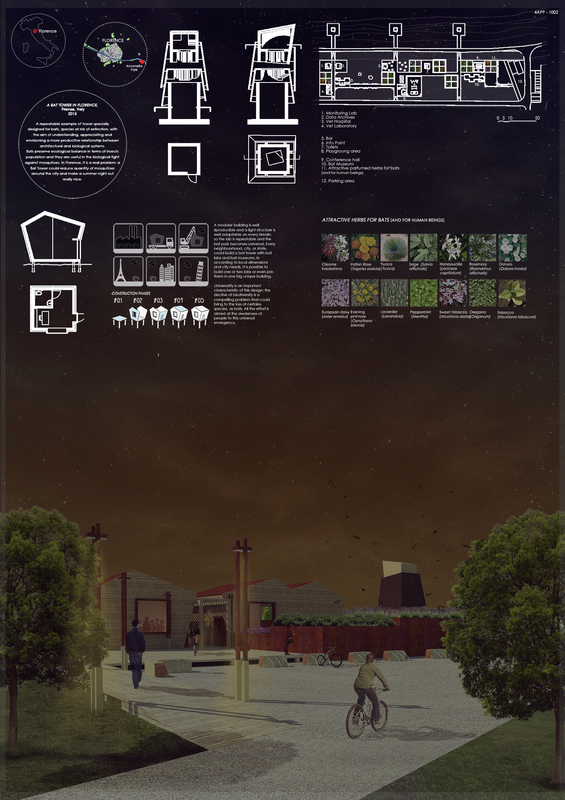 I proposed a bat themed park including three bat towers and diverse areas dedicated to different users: an educational area with a museum and a conference hall, a playground designed for children who can experience some of the main activities of bats, and finally all kind of laboratories specially designed for wild animals, in particular bats, so it could be possible monitoring and take care of them. A little opportunity to save biodiversity and restore it in an urban context as a city park.